Movie lovers back up Blu-ray to Apple TV and other HDD media players mainly for three reasons: Firstly, Blu-ray Discs are easy to break, but a digital copy is safe and permanent, even if the data get lost, there’re ways to recover. Secondly, shrinking Blu-ray to Apple TV protects the expensive Blu-ray Discs from scratches and wore out– do you think you’ll still hunt for a movie in hundreds of DVDs and Blu-ray discs while you can easily find and play the movie on the bed with a remote control in hand? Thirdly, ripping Blu-ray to Apple TV solves the problem of BD region code restriction. Commercial Blu-ray Discs could be Region A, B and C, and not a BD player will read full region Blu-ray Discs. Things happen that your BD player refuse to read the BD you BD purchased from oversea market (unauthorized region). The following guide tells you how to rip Blu-ray to Apple TV meanwhile extract the AC3 audio track. After ripping BD to Apple TV, you get unprotected HD contents, which can be copied to other media players as well. The Apple TV can not decode AC3 5.1 codec? It doesn’t matter, because the device is able to optically pass through the AC3 audio to your AV receiver that decodes Dolby Digital. Actually AAC 5.1 is a better choice when your receiver supports the AAC codec. Anyway, let’s get down to the guide. Download a free trial of Pavtube Blu-ray Ripper first. 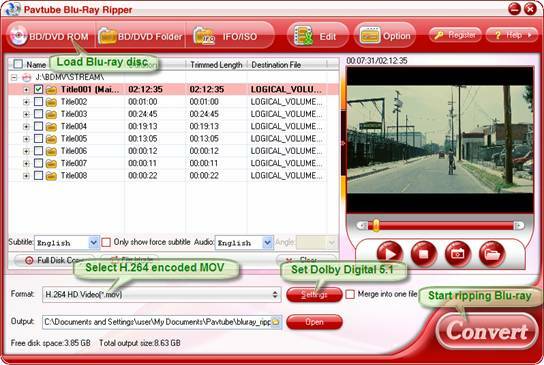 The Blu-ray Ripper software helps you crack the copy-protections of commercial Blu-ray Discs and DVDs, and convert the movies to various video and audio formats for Apple TV, iPad, iPhone 4, iPod Touch 4, PS3, Wii, Android smartphones, etc. Connect an external BD drive to your PC if there is not an internal one. Place in source Blu-ray disc. Install and launch the Pavtube Blu-ray Ripper software, click “BD/ DVD Folder” and navigate to the Blu-ray BDMV folder, click “Choose”. When the Blu-ray is loaded to Blu-ray Ripper, you can select subtitles and audio track (English, French, German, Spanish…) for each chapter. Forced subtitles can be attained, too (learn more about forced subtitles in Avatar Blu-ray). Step 2. Set H.264 HD MOV as format. Click on “Format” bar to select output format. 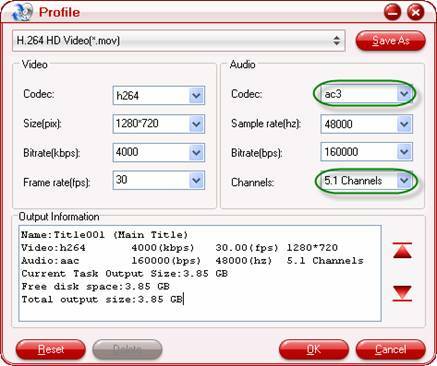 Here you are advised to follow “HD Video” and select “H.264 HD Video (*.mov)”. Under the tab of “Apple TV” there are Apple TV optimized formats with AAC 5.1 and stereo audio, but here we do not use these formats. Step 3. Customize the formats to be optimal for Apple TV and set AC3 5.1 track. Click on “Settings” and you could further customize video and audio parameters. For Blu-ray to Apple TV conversion, optimal settings should be Video Size- 1280*720 (for a 16:9 screen), Video Bitrate- 4000kbps at highest quality, Video Frame rate- 24fps or 30fps, Audio codec- ac3, Audio Sampling rate- 48000hz, Audio Bitrate- 160kbps, Audio Channels- 6 Channels, just as it shows in below picture. Don’t forget to click on “OK” to confirm your settings. Click on “Convert” button to start Blu-ray to Apple TV conversion on Windows. The Blu-ray Ripper will bypass copy-protections and convert Blu-ray to Apple TV video with AC3 6 channels track. After conversion you can click “Open” button to get the final ripped Blu-ray files (H.264/ AC3 MOV videos). Step 5. Play the ripped Blu-ray movie with Apple TV and AV receiver. Connect Apple TV with your PC. Open iTunes, find the Movies library of Apple TV in DEVICES, and drag the converted Blu-ray movies to the Movie library of Apple TV. Or you may copy the movies to iTunes Library and sync them to Apple TV in batches. When playing ripped Blu-ray movie with Apple TV, make sure an optical cable is used to pass through AC3 5.1 track to your AV receiver. Some folks find audio is missing while video plays fine. This is because they are using Analog audio ports to output audio instead of Optical digital audio port, or the connected AV receiver/amplifier does not support AC-3 decoding. Learn more about the Pavtube Blu-Ray Ripper. Take a look at a more powerful application, the Pavtube Blu-Ray Video Converter Ultimate, which converts Blu-ray, DVD, Videos to Apple TV and other devices on PC. 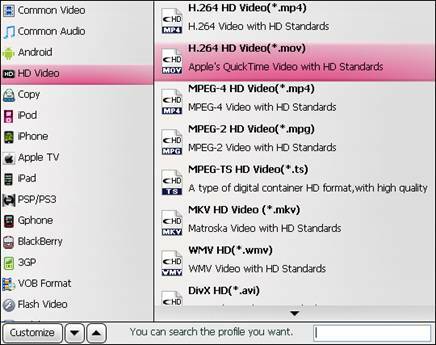 Find a program to rip Blu-ray to Apple TV with AC3 5.1 track on Mac OS- the Pavtube Blu-Ray Ripper for Mac. DVD to Apple TV Conversion on Mac: AAC/ AAC/ DTS 5.1 surround sound or Stereo? Enjoy Blu-ray and DVD movies on Samsung Epic 4G? Watch Blu-ray and DVD movies on Samsung Galaxy Tab? Watch Blu-ray and DVD movies on Samsung Vibrant? Watch Blu-rays and DVDs on Android phones, like Motorola Droid X, HTC Evo 4G, HTC Legend, Nexus One, etc.? Rip Blu-ray and DVD discs for playback on HTC Evo 4G ? Transfer videos, standard DVDs and Blu-ray movies for playback on Motorola Droid X? How to rip Blu-Ray to PC for playback?